This piece originally appeared in our Japan magazine - you can order a copy here. The first thing you notice is the noise. Pedestrian crossings, escalators and subways trill and beep while alleyways resonate with emphatic voices luring you at full volume into shops and arcades. Totally bewildering at first, flashing lights, brash advertising and constant momentum only add to this raucous cacophony and you quickly find yourself a bemused observer of the throng. Yet Osaka is enigmatic and under this clamour is another world, one populated by friendly citizens who don’t take themselves too seriously, and plenty of paradox. Wide promenades are criss crossed by neighbourhood laneways seemingly narrower than the cars navigating them. Fluorescent neon floods the sky whilst lanterns and a canopy of exposed power-lines light historic alleyways. Shrines, love hotels and street food vendors sit side by side, and immersed within the teeming masses, instead of feeling hemmed in, you experience a surprising sense of calm. 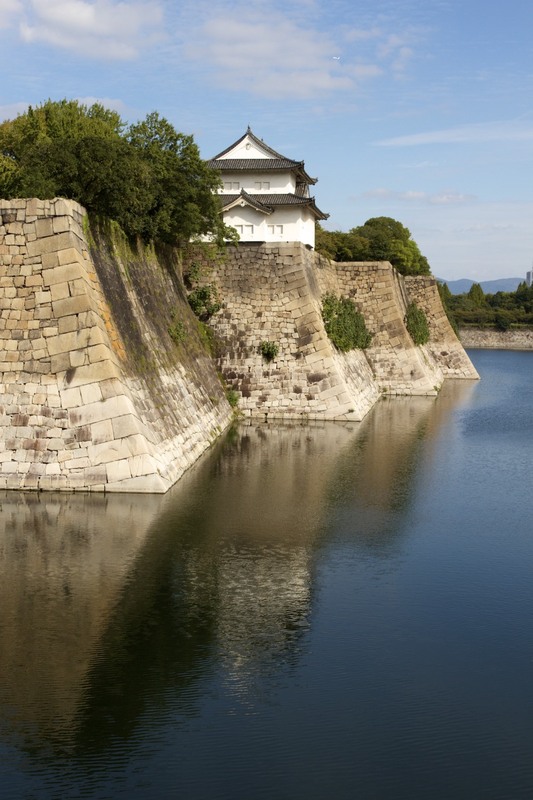 So how to explore the layers and ambiguities of Osaka? Getting your bearings from the top of its tallest buildings, the Umeda Sky Building or Abeno Harukas, is a start. But then it’s best to just meander, locals happy to help disorientated tourists lost in the maze. Composed of village-style neighbourhoods, you’ll uncover tiny vintage and design shops (not to mention cat cafes) amidst the quiet lanes of Nakazakicho or boutiques of bustling Umeda. You can walk for kilometres along the vibrant arcades of Shinsaibashisuji and Tenjimbashisuji, visit frenetic Amerikamura with its cutting-edge shops and quirky lampposts, or window-shop in a daze along Midosuji Avenue. Turn off throbbing Dōtonbori (following the scent of incense through seemingly empty alleys where jazz first appeared in Japan) to Hozenji Temple where the juxtaposition of pious worshipers and chaotic nightlife is enthralling. Wherever you go, food is ever- present. Thousands of stalls and restaurants line the streets where Osakans happily kuidaore, or ‘eat oneself to ruin’. Known as ‘The Nation’s Kitchen’ from its roots as a major trade and rice storage port, today this food-centric city has a reputation for entrepreneurship and creativity, even boasting the first sushi train. The Japanese believe those from Tokyo will become paupers from buying shoes, in Kyoto from kimonos and in Osaka from food, and while regularly frequenting three or four restaurants and bars in one night could induce poverty, the rule that ‘cheap is good’ sees residents snub non-compliant eateries. Whether enjoying over-the-counter Kappo style dining (in such close proximity the chef adapts ingredients to suit customers’ moods), tachinomi (where standing while drinking is the custom), or dishes from street food stalls, the fare is unfailingly good. Over days spent wandering through markets and arcades guided by replica plastic food and orderly yet eager queues - or even blindly guessing from menus - I ate my way through Osaka. In Dōtonbori I feasted on moreish takoyaki, dough balls filled with octopus then lathered in sauces. For something different, Takoriki in Karahori uses kombu dashi, red ginger and freshly boiled octopus to create delicious morsels served with Champagne. In Shinsekai, kushikatsu, deep-fried skewers, were covered in a light, crunchy batter, magically maintaining the sweetness of tomatoes and succulence of salmon. Dipping only once in the accompanying sauce lest I wreaked the wrath of fellow diners, they were a perfect snack. Numerous restaurants and stalls offered okonomiyaki, savoury pancakes loaded with a variety of ingredients (cabbage is a staple) then doused in decorative sauces. Once only a meal for the aristocracy, today it’s enjoyed by everyone, especially at Yukari which has been perfecting its recipes since 1950. Said to combat diabetes, the pork, shrimp and squid mix is a classic, precise flipping ensuring the ingredients are steamed perfectly before being topped with ‘dancing bonito’. At Kuromon Market, a 190 year old destination for local gourmands, the seafood choices are plentiful but my pick for quality sushi is Ichibazushi where tasty morsels (customarily devoured in a single bite) are prepared with artistic flourish. Despite the language barrier it was a joy to interact with the chef as he cut and seared fish that tantalised my taste buds - although I declined tessa (pufferfish sashimi) despite knowing it wouldn’t be lethal in his expert hands. Markets also proffered yakiniku, beef barbecued over charcoal and seasoned with salt, sesame oil or sweet wasabi. While I was too full to sample the horumon barbecue, where every part of a chicken (including pieces I didn’t know were edible) is cooked, I later tried kitsune udon, the noodles floating in a light dashi unique to Osaka and topped with tofu. Having even found stalls selling giant candy floss and the world’s tallest soft- serve, eating myself to ruin had been accomplished. Mirroring the conundrum that is Osaka, alongside these hectic food stalls and tiny eateries are some of the world’s premier dining establishments. At Michelin three- starred restaurant Fujiya 1935, chef Tetsuya Fujiwara uses childhood memories to create a progression of courses that excite the senses, the food more about the feelings and sensations they evoke than individual ingredients. Chilled wasabi pasta decorated with carrot leaf and topped with sorbet followed the curves of the lotus-shaped plate like a work of art. Smoke from smouldering embers under a chestnut pudding with coffee jelly rose like a magic potion, its scent reminiscent of traditional autumn hay-burning. More than just a meal, eating here is like unwrapping a seasonal gift from nature enhanced by youthful recollection. But what creates the flavours of Osaka? Seaweed expert Junichi Doi believes it is umami, the savoury taste found in kombu kelp, the basis of all broths in Osaka. Wearing gloves to handle seaweed that had ‘slept’ in a box for four years, we studied its greenish-grey hue, admiring the quality of the Hokkaido harvest. Fully aged, it is prepared for sale in Doi’s shop so anyone from Michelin chefs to home-cooks can create delightfully aromatic dishes. Those equally dedicated to their craft are the knife- makers of Sakai, traditional craftsmen from Mizuno Tanrenjo employing centuries-old techniques to shape steel and iron into the sharpest of tools. Few have mastered this art, with knife making a descendant of sword making, famously produced in the region before the fall of the samurai. Locals take as much pride in cutting and slicing as they do in cooking, the right knife imperative in ensuring food’s piquancy is preserved. Sated after days of dining, I required amusement and while Osaka is proud of its thriving comedy scene, traditional forms of entertainment also flourish here. Hoping to protect the arts for future generations, Yamamoto Noh Theatre holds workshops and has performances in Noh (mask theatre), Rakugo (comic storytelling) and Bunraku (puppetry) that, despite being written over 600 years ago, are just as apt today; family worries, jealousy and vengeful woes apparently timeless. Sitting in the audience with the troupe from Cirque du Soleil I became lost in stories told purely by animated expression, intonation and evocative movement; with my lack of Japanese it was the only way to listen. Being able to draw an audience into the histrionics requires enormous mastery and years of training (it takes 20 years to control a puppet’s facial expressions), but by combining commitment with newly written plays on contemporary issues this intense art will continue to captivate. 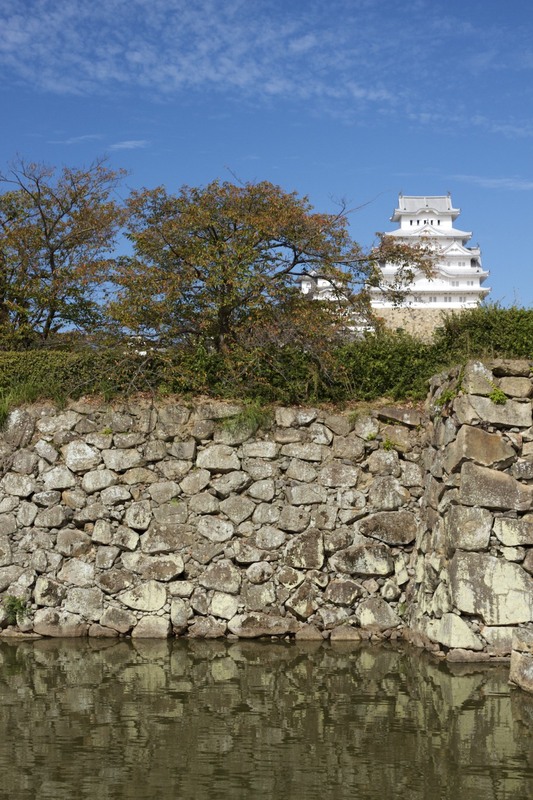 There are also plenty of nearby destinations for day-trips such as Himeji, with its glistening white castle and Koko-en Garden, and Nara, with its roaming deer. Above a valley of rice paddies and owering cosmos is Kōyasan, a sacred Buddhist site where temples abound and the divine entity Kōbō Daishi, who brought Buddhism to Japan, lies in eternal meditation. Pilgrims have visited the site for over 1,000 years and following some through the cedar-filled Okunoin, with its 200,000-plus graves and moss-covered monuments, was serene rather than sombre. 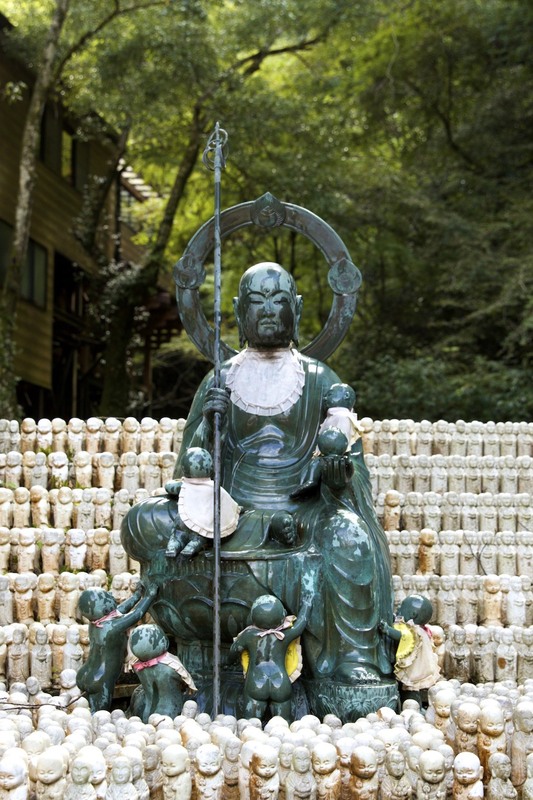 Mount Inunaki, near Kansai International Airport, is a spiritual mountain retreat guaranteeing tranquillity. Wandering along pathways built over 1,350 years ago, past pristine waterfalls and shimenawa ropes denoting hallowed ground, I contemplated my tiny place in this beautiful natural setting. The gods of fire and water (appearing in the form of a sword-swallowing dragon) can be worshipped here, wishes fulfilled and purification attained by the ascetic exercise of ‘waterfall meditation’. This ritual can be brutal, some monks staying under icicle-laced water for hours, although quicker reflection is acceptable for visitors. Afterwards, Minamitei is perfect for a kaiseki-style lunch where a sequence of artistically garnished seasonal dishes are served as you sit on tatami mats in private dining areas. Later, relaxing with mothers, daughters and gossiping grandmothers in the healing waters of the onsen I understood true satisfaction. With so much to discover, it’s worth getting lost in Osaka’s flamboyance, for it is then that you’ll find quietness behind the noise and meet people that charm. All the while revelling in plenty of guilt-free eating.